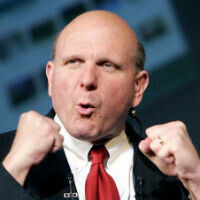 Steve Ballmer sent out a memo yesterday detailing his plan for restructuring Microsoft. The memo was extremely long, to say the least. We boiled it down to the relevant bits for you, and The Joy of Tech even made fun of Ballmer's attempt to describe the "lean and efficient" new Microsoft. But, this video may be the best way to understand the basics of the One Microsoft plan in about 2 minutes. The video comes from Ballmer speaking at a Microsoft Town Hall Meeting yesterday. The first 40 seconds are so give an overview of the plan and the newly appointed heads of the newly created divisions, then you'll get the usual ebullient Ballmer laying out his vision for the future of Microsoft. It's definitely a much easier way to get the info, though obviously not quite as detailed. But, that's probably a good thing. That's quite hysterical, he's screwed up Windows Mobile for the last 8 years now he wants to explain it in a 2-minute video??! WinMo isn't all he's screwing up. As a die hard MS user, I'm finding the urge to look elsewhere for a computer OS to use these days. Or, just do what I do: Multi-Boot System with XP Pro; 7 Ultimate; Mac OS; and, Win8 Pro, just to have it (although, right now, it's pretty useles). Of course, Intel-based MOBO/CPU and bootlegged' all the way. Windows Mobile has been mostly dead for 2 years... He's doing a good enough job to keep the Board of Directors and investors happy.